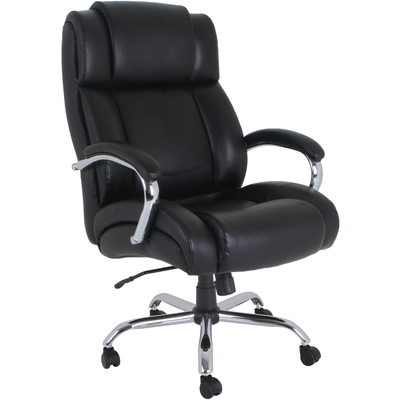 LLR99845 : Lorell Lorell Big And Tall Leather Chair With Ultracoil Comfort - Black - 30.3" Width X 22.9" Depth X 45.8"
Lorell Big And Tall Leather Chair With Ultracoil Comfort - Black - 30.3" Width X 22.9" Depth X 45.8"
Big & Tall Chair Features Bonded Leather Upholstery, A 500 Lb. Weight Capacity And Ultracoil Comfort With Coiled Comfort Springs. This Advanced Foam-Layering System Is Designed To Offer Deliberate, Unique And Zone-Based Support For A More Enjoyable Seating Experience. Functions To Customize Position Include Pneumatic Seat-Height Adjustment (3-1/2" From 19-7/8" To 23-5/8"), 360-Degree Swivel, Tilt And Tilt Tension. Fixed, Chromed Metal Arms Feature Upholstered Pads. The 29" Chromed Metal Base Is Equipped With 2" Heavy-Duty Nylon, Hooded, Dual-Wheel Casters. Seat Measures 23-5/8" Wide X 20" Deep. Back Size Is 24-2/5" Wide X 25-3/4" High..